Over the past twelve to eighteen months, there has been an increase in the number of new people entering the workforce as companies have begun hiring again due to the economy getting stronger. One thing is certain when a company increases its work-force, there will be more risk taken on by the company, and this is why is it vital that companies make sure that an EPLI policy is a part of their overall Phoenix business insurance program. When discussing this particular type of coverage and explaining that having Employment Practices Liability Insurance coverage can protect their business, many times clients and prospects have difficulty in seeing its value. “EPLI” or Employment Practices Liability Insurance, is professional liability insurance that covers certain employment related claims made by employees. Many times business owners see this type of coverage as an extra expense and not really important in protecting their business and assets. They couldn’t be more wrong about this considering how many EPLI claims are paid each year. Considering just how litigious the environment is today, having Employment Practices Liability Insurance Coverage is vital if you have employees and they are interacting with the public or at other businesses. Having EPLI coverage may also protect the company owner from potential meritless claims brought by disgruntled employees. 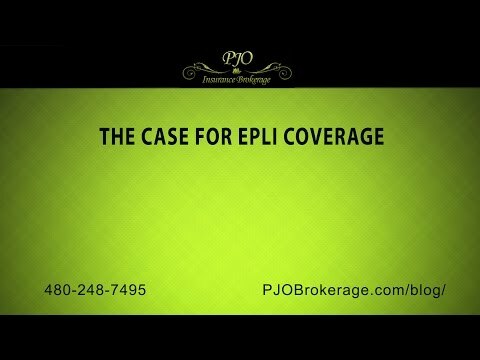 We understand that, as a company, your policy is to be as fair and non-discriminatory as humanly possible, but keep in mind gender and age gaps and old habits that refuse to die that can lead to miscommunications, having an ELPI Policy can serve as a first and last line of defense against employment related claims. In general, an Employment Practices Liability Insurance Policy can cover such things as workplace discrimination, workplace harassment, emotional distress, hostile work environment, or wrongful termination of an employee. When discussing why a company should add this type of coverage to their insurance program, a very good example would be one of your managers discriminates against or harasses an employee for any number of reasons. An additional example is if your employee is in the field and harasses a client, whether the employee made a bad remark, or, in a really worst case scenario, sexually harassed one of your clients resulting in a lawsuit against your company from a third party. The number of lawsuits filed by employees against their employers in this country has been steadily on the rise, and the outlook for the foreseeable future is that these types of claims will only increase, and companies need to have adequate insurance coverage. Determining what the premium will be for Employment Practices Liability Insurance Coverage depends on what of business your company is in, how many employees you have, your gross sales, and numerous other risk factors, and especially important, whether or not your company has been sued for employment practices claims in the past. If your previous history shows no claims, it will be a major factor in keeping your premium down. Typically, EPLI policies will reimburse your business against the costs of defending a lawsuit in court and for judgments and settlements, depending on state laws. The EPLI policy can cover legal costs whether your company wins or loses the lawsuit that was filed against it. Please be aware that EPLI policies usually do not pay for punitive damages (unless where allowable by law) or civil or criminal fines. Other liabilities covered by other insurance policies, such as workers compensation, are excluded from EPLI policies. Since we are discussing Employment Practices Liability Insurance, recently I came upon an article in one of our trade magazines. The article was about an employee who went through the proper chain of command when filing a complaint, first, to the immediate supervisor, then with the company’s Human Resources department, and, lastly, with a member of the senior management. What is truly amazing about this story is that after all the right things the employee did in reporting this, nothing was ever done, no follow up to even check out the situation. Due to the company’s failure to respond to these complaints, this employee has hired a very high powered law firm and is suing the company for the stress and humiliation it caused the employee. This is all due to someone dropping the ball, so to speak. Instead of simply addressing the complaint and working with the employee, this is now heading to court and a legal battle on the EPLI claim. Regardless of the outcome, the legal costs will be high. As one can see, it is much easier to handle the problem once it is presented versus ignoring it until it becomes a claim and lawsuit and ends up costing the company thousands of dollars. At PJO Insurance Brokerage, the experienced and professional brokers have access to various Employment Practices Liability Insurance carriers, and we welcome the opportunity to assist you in obtaining Employment Practices Liability Insurance for your company’s needs. Give us a call today, We look forward to working with you company in the near future.